Cospheric recently added density marker beads in aqueous solution to their range of products. Available in densities from 1.02 g/ml to 1.13 g/ml. The beads come in a variety of colors and densities and ship within one business day. 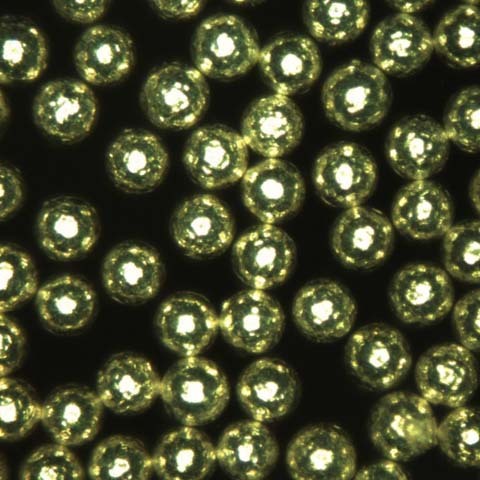 These beads are small microspheres of very specific particle density that are used to visualize density gradients. Commonly used in Percoll gradients these beads offer a fast visual indicator for scientists. Cospheric Density Marker Beads are provided at a 20% concentration in an aqueous solution in 2.5ml vials. Unlike density marker kits which used to be manufactured by GE Healthcare and have been discontinued, the Cospheric’s colored microspheres are ready for use right out of the vial, don’t need to be swollen, will work with any media, do not expire, and do not change density over time. Pages 45-50 on Density Gradient Centrifugation. What makes a microsphere FDA-approved? In order to tell whether the microsphere can be used in cosmetics, food, or medical devices it is important to look at the raw materials that are incorporated into the microsphere during manufacturing process. For example, unpigmented or clear polyethylene microspheres supplied by Cospheric in sizes from 10 micron to 1000 micron meet the quality requirements of the US FDA as specified in 21 CFR 172.888 and 21 CFR 178.3720. Specific grade of polyethylene used in manufacturing of these microspheres is FDA-approved for food applications in chewing gum base, on cheese and raw fruits and vegetables, and as a defoamer in food. Approval. All color additives used in cosmetics (or any other FDA-regulated product) must be approved by FDA. There must be a regulation specifically addressing a substance’s use as a color additive, specifications, and restrictions. Certification. In addition to approval, a number of color additives must be batch certified by FDA if they are to be used in cosmetics (or any other FDA-regulated product) marketed in the U.S. Identity and specifications. All color additives must meet the requirements for identity and specifications stated in the Code of Federal Regulations (CFR). Use and restrictions. Color additives may be used only for the intended uses stated in the regulations that pertain to them. The regulations also specify other restrictions for certain colors, such as the maximum permissible concentration in the finished product.